The second set of organs, proceeding inwards, constitutes the corolla; and, if the parts are free, they are termed petals, as in the Buttercup, Rose, Camellia, Sweet Pea, and Strawberry (fig. 47). Very often all the pieces are united for a greater or less part of their length, when the corolla is said to be gamopetalous, as in the Primrose, Salvia, Dandelion, Stephanotis, Gardenia, and Campanula (fig. 48). The lower part of these flowers is the tube and the expanded portion the limb; the latter is often two-lipped, as in Salvia and Lamium (fig. 49, 1). The corolla is bell-shaped in Campanula, funnel-shaped in Convolvulus, and so on. It is usually the most showy part of the flower, protecting the inner parts, but designed more particularly to attract and guide insects to the nectar. In the Christmas Rose, Winter Aconite, and Globe Flower (Trollius), the petals are small and modified to form nectaries, and this would explain why the sepals are large and highly coloured. The modifications are endless, and usually have some reference to the method of fertilization. The corolla is said to be regular when all the parts are alike, but irregular when they are of different sizes, shapes, or disposition, as in Salvia, Snapdragon (fig. 49, J), or Sweet Pea. Fig. 47. - Strawberry Flower. 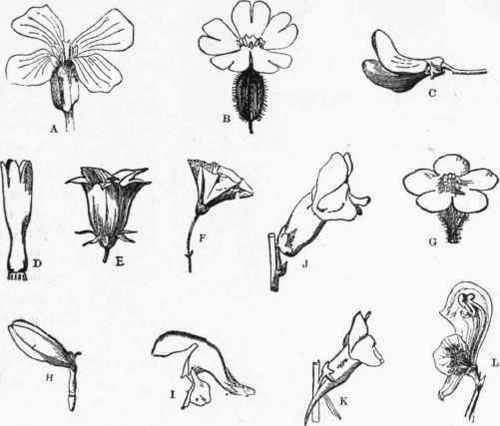 p, petals; s, sepals. Fig. 48. - Campanula Flower, showing a regular flower with five -parted calyx and corolla. The leaf on the pedicel is called a bract. Fig. 49. - Forms of Corolla. A, Cruciate. B, Caryophyllaceous. C, Papilionaceous. D, Tubular. E, Campanulate. F, Funnel-shaped. G, Rotate. H, Ligulate. I, Labiate. J, Personate. k, Personate and spurred. L, Nectaries. In many flowers the outer and inner whorls, representing calyx and corolla, may be of the same texture and colour, and in such cases they are collectively termed the perianth, as in Daffodils, Lilies, Amaryllis, Tulips, Crocuses, Irises, and other Monocotyledons. In many Dicotyledons, however, there is only one set of organs, which may be green or coloured, and the term perianth is also applied to them, as in Daphne, Marvel of Peru, Knotweeds (Polygonum), and Docks. The large white leaf of the Arum Lily is not a corolla, but a large bract enclosing a spike of small flowers, and termed a spathe.